Step by step Keisotsu Butai. So, I kinda bought a lot of Japanese Sectorial Army troops. I knew this day was coming ever since I painted up that first Oniwaban. Still, I was not expecting it to be so soon. I’ve been painting them up real quick for a competition, so I haven’t been posting about them as I go. I’ll try my best to catch up! Luckily, JSA does not have a particularly wide colour palette, so I will probably only have to talk about that aspect once and then keep referring back to it. So without further ado, here is a step by step description of my method for painting Keisotsu Butai. Step 1: I used PVA to glue a fine black sand to the base. 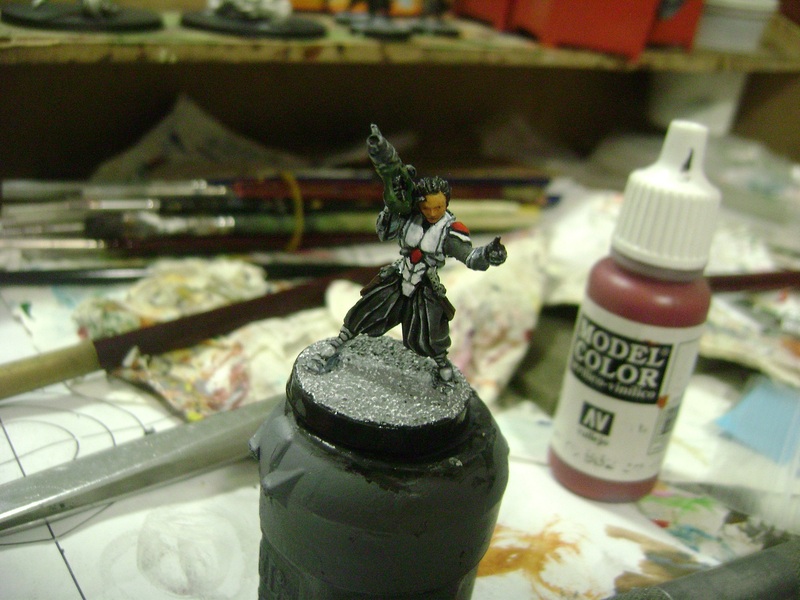 When it was dry, I used Army Painter Uniform Grey spray primer to prime the model. I have no colour in a pot that matches Uniform Grey, so I mixed Citadel Dawnstone and Shadow Grey to get any spots I missed with the spray. Step 3: The whole model save for the future white and red armour panels was washed with dilute Citadel Abaddon Black. This was heavier and included multiple layers on parts that would be black (Hakama trousers, gloves, hair). Step 4: Red armour panels and sleeve stripes were base-coated with Vallejo Cavalry Brown. Step 5: The same red areas were accented with Citadel Blood Red. I used Abaddon Black to “seal it in”, so that there would be a clear edge with the future white bits. Step 6: Depending on skill/effort budget, the metallic areas from Step 2 were edged/drybrushed with Citadel Skull White. Step 7: I didn’t have a suitable green, so I mixed Vallejo Mutation Green and Citadel Castellan Green to basecoat the missile launcher. Step 8: I mixed Citadel Bleached bone with the Castellan Green to highlight the missile launcher. Step 9: The whole face was painted with Vallejo Bronze Fleshtone. I noticed I’d done the pants a bit thick while I was waiting for it to dry, so I picked out the sharp edges (easy to do) with Citdael Fortress Grey. Step 10: While waiting for the face to dry (very important! 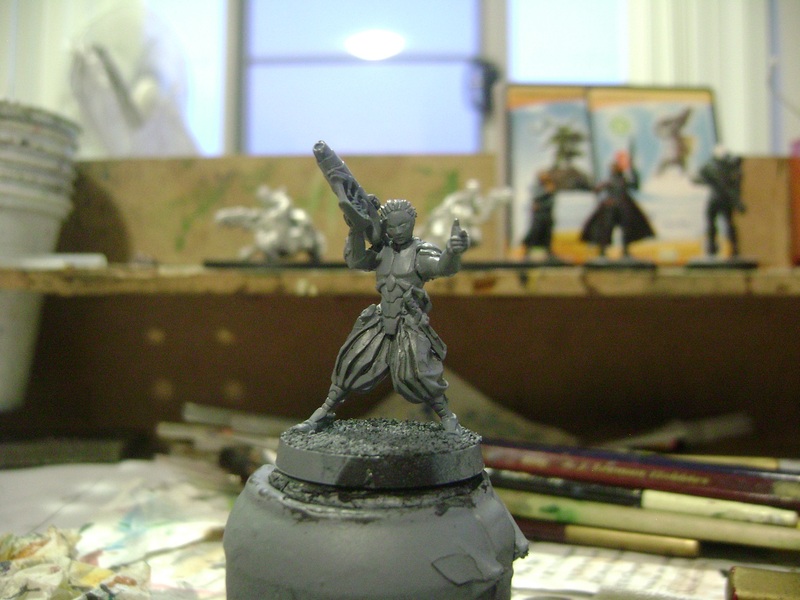 ), I basecoated the holster and scabbard with Citadel Scorched brown. Step 11: After the face was dried, it was washed with dilute Cavalry Brown. It’s important to test the thickness and opacity of the diluted paint on a palette before putting it on the models face. While waiting for it to dry, I picked out the raised parts of his boots with Fortress Grey and Skull White. Step 12: All the white parts were painted Skull White, carefully avoiding the recesses in the armour. This transforms him from a greyish blob to Keisotsu Butai. Step 13: Detail time. 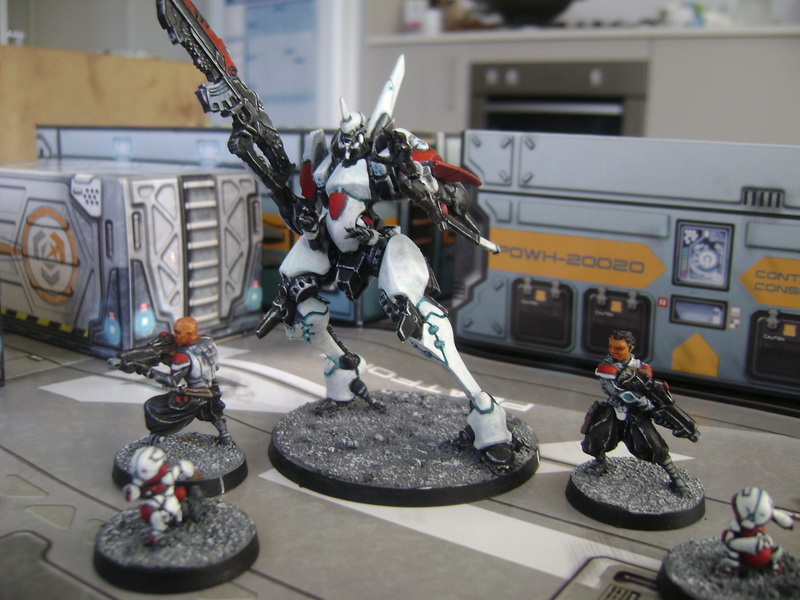 The holster and scabbard were painted with Citadel Graveyard Earth, avoiding the recesses. The grips of his pistol, knife and missile launcher were drybrushed with bleached bone, trying not to fill the pores. If you do fill a pore, you can use a detail brush to try and flood the pore with a dilute black once it dries. A spot of white was used to highlight the buttons on the holster and scabbard. Now would also have been the time to do the lights of his comlog but I forgot.I did however get brave and added some black dots for eyes. Step 14: Dawnstown was painted thickly over the basing sand. Step 15: Once completely dry, the sand was dry-brushed with skull white, and the vertical face of the base was painted thickly with Abaddon black.